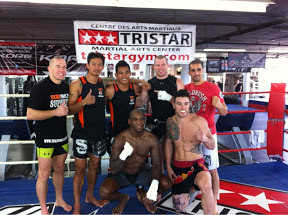 Thanks to Lad & Lam from Tiger Muay Thai in Thailand for coming to help GSP train. Also got training with Miguel Torres from Chicago, Brandon Thatch from Denver, Francis Carmont from France and, of course, Coach Firas Zahabi of Tristar. Got some cool tricks to show my teammates back home in Denver!